I have looked previously at concerns about civilian casualties during the first part of the conflict. Since allegations of civilian casualties increased astronomically during 2009, it will be salutary to address these separately. 11. Concerns were expressed in January 2009 that civilians were falling victim on a large scale to army attacks. Whereas in the last seven months of 2008 only 78 civilian deaths were alleged by Tamilnet, in January 2009 alone there were allegations of 689 civilian deaths. The largest allegation in this regard was on January 26th when there was an allegation that more than 300 people died. There was another allegation on the same day of more than 100 civilians killed. Both allegations refer to the safety zone, and it is possible that the references are to the same incident. These allegations occurred a day after the Bishop of Jaffna said he would be ‘urgently requesting the Tigers not to station themselves among the people in the safety zone and fire their artillery-shells and rockets at the Army. This will only increase more and more the death of civilians thus endangering the safety of the people.’ This was also the time when the UN Resident Coordinator, having first thought the army was firing into the safety zone, sent a text message to say that most of the firing came from the Tigers. While it is possible that retaliatory fire by the forces led to casualties too, it is quite clear that many of the deaths were caused by LTTE shooting. Bearing in mind the success of this strategy in the East, when Human Rights Watch, despite evidence it recognized of armed Tiger cadres in a refugee camp, squarely blamed government for what it termed indiscriminate firing on civilians, it is more than likely that the Tigers counted on similar misrepresentation. In short, from their point of view, they were in a win-win situation – if the army did not fire back, they could kill members of the Sri Lankan forces with impunity, if the army did fire back, they could claim – and count on agencies such as Human Rights Watch to claim – that the forces were firing indiscriminately on civilians. Anyone stooping to such a strategy would obviously have had no qualms about ensuring that there were civilian casualties. There were 55 air strikes in January 2009 in only three of which were there allegations that civilians had died. In two of these the allegations were of single figures. On the 28th, 39 deaths were alleged, but this seems to have been in connection with army activity mentioned in the same report. 12. Over the next three months there were many more allegations of civilian deaths. The total allegedly killed by the army between February and April was 5313, while a few hundreds more are attributed to the Air Force, with casualty figures sometimes not specified. 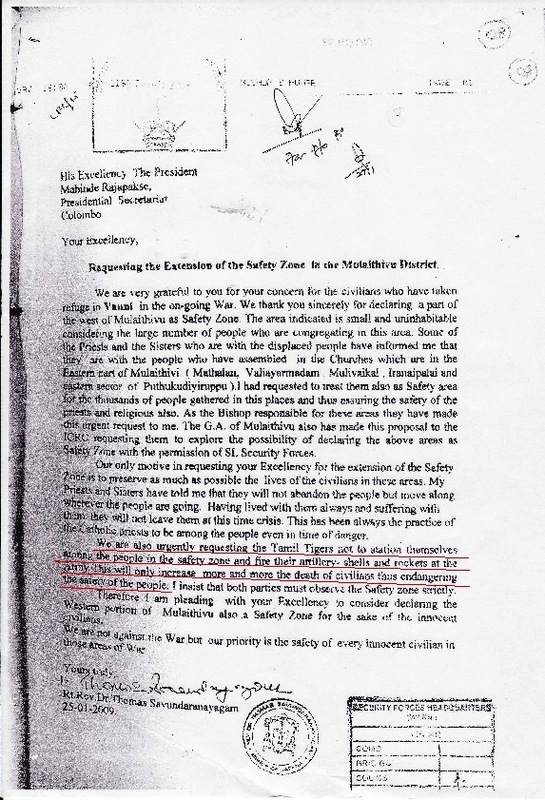 Those killed are almost always referred to by Tamilnet as civilians. There is no mention of casualties amongst LTTE cadres. Given the large numbers of civilians forced by the LTTE into fighting for it, it is necessary to recognize that a number of those killed were to all intents and purposes civilians. The number of those whose mindset and approach was basically civilian, who were nevertheless forced into battle by the LTTE, may well have been tens of thousands, given the well attested determination of the LTTE that all families should have contributed at least one member to their cause. These untrained victims were often sent to the frontlines. In any attack on LTTE positions, it is more than likely that a high proportion of those who suffered were in essence civilians. That they were basically innocent of terrorist ideology or activity however does not make their deaths a matter of culpability for those who fought against them, since they were being incited to kill, and in some cases had received training that enabled them to bear arms not entirely hopelessly. It is possible therefore that the figure of deaths cited by TamilNet is accurate, but it should be noted that not all of these can be classed as civilians in terms of their engagement in the conflict. At the same time, the figure needs to be considered in the context of the numbers cited by the ICRC as having been taken to hospital by sea during this period. The ICRC took 13,826 persons away between February 9th and May 14th, in operations assisted by the Sri Lankan navy and the Department of Health. ...in some cases had received training that enabled them to bear arms not entirely hopelessly. Of this figure, only 4.520 were actually injured. While about 2,000 more were sick, the remaining 7,000 seem to have been what are termed bystanders. Though there are some discrepancies between these figures and those provided by the Sri Lankan forces which registered those who were transferred, it is not in dispute that more bystanders were transported than patients, whether wounded or sick. Assuming the usual ratio in conflict situations between wounded and dead, and assuming that we are talking here only about civilians, it would seem that there would have been just about 1,500 dead. Even if we double the figure, we would have just about 3,000 killed. 13. There is concern that the United Nations thought that about 7,000 persons had been killed by May, but concealed these figures through anxiety not to compromise its position with government. This concern has been presented by elements in the UN that disagreed with the official UN position, and had no qualms, as revealed by journalists, of leaking information to the media. The UN had in fact first begun to keep unofficial statistics in February, though it did not reveal to government that these were on the basis of a network of informants put in place by the UN Head of Security, a South African called Chris du Toit who had previously worked for the terrorist Jonas Savimbi in Angola. Soon after his first figures were mooted, the Ministry of Disaster Management and Human Rights called him in to discuss the basis of his figures, and were told that they were based on three categories, viz direct eyewitness accounts, reports from other sources, and extrapolations. Out of a total of over 1,000 that du Toit had initially advanced, it turned out that only 38 were actually based on eyuewitness accounts. He agreed that the extrapolation was not reliable, and thereafter the UN refrained from canvassing these figures publicly, though they were used with no disclaimers as to the methodology involved by the UN High Commissioner for Human Rights, who seems to have acted in concert with the junior members of UN staff who disagreed with their superiors rather than with those actually holding positions of responsibility. Though the figure of 7,000 was acknowledged by the UN to be only an estimate, it has since passed into legend, and was made the basis of further wild allegations, which will need to be examined further. It has never been considered in the light of the ICRC figures or indeed those advanced by TamilNet, which could otherwise have been relied upon to present a worst possible case scenario. It is not surprising however that some elements in the UN seem to have outdone TamilNet in this regard, presenting as absolutes what responsible UN officials granted was not a reliable figure.